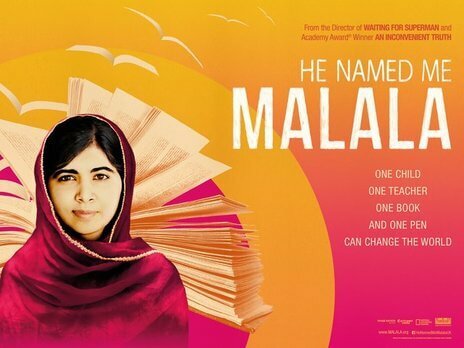 The story of Malala Yousafzai is no doubt an inspiring and thoughtful one. A teenage Pakistani activist who spoke out against the Taliban and their negative stance on female education, she was targeted by gunmen and shot in the head, an event that sparked worldwide coverage and interest, especially after her miraculous recovery. Her continuing of her campaign for granting education to disadvantaged children has earned her even more worldwide attention, and in 2014 she was awarded the Nobel Peace Prize for her efforts. Unfortunately, that’s also as deep as Davis Guggenheim’s documentary He Named Me Malala is willing to go in terms of actually exploring its subject in full detail. The intentions of the film are no doubt honourable; Guggenheim – an Oscar-winner for his Al Gore global warming film An Inconvenient Truth – wants to craft a portrait of this fascinating figure while also trying to find new dimensions to ultimately humanise her. This is done through several filmed scenes at her family home in Birmingham, England; she playfully acts the big sister role with her two younger brothers, she reveals several marked tests in various school subjects that see her not even achieving 75%, and she reveals to harbouring a teenage crush on famous figures like Brad Pitt and Roger Federer. However, they don’t really say anything about her as a person, other than she’s just a teenager who just happens to have gone through a tragic situation. As nurturing as these scenes can be, there is never a sense of what makes her truly special, and in a film about who is undeniably an inspiring figure it’s a rather disappointing section that sadly undermines her actual key attributes. It’s a pattern that unfortunately repeats itself throughout the movie; we see Malala and her several humanitarian missions to several countries and districts where war-torn environments and under-privileged economies are preventing children from achieving a full education, and it’s extremely noble as you would expect, but nothing sticks out that says anything new about the subject herself other than what one may find on a very detailed Wikipedia page. It’s the same with several sequences that show her engaging in a press tour and meeting several political dignitaries from Barack Obama to former Daily Show host Jon Stewart; while it’s undoubtedly fascinating to watch and learn about, there’s nothing new that this documentary, and by extension Guggenheim, seems to be able to bring to the whole ordeal. The one element that does truly stand out is whenever it desires to examine the Yousafzai family history or their former Pakistani society, which heavily features colourful and stunning animated segments spliced with interview soundbites and archival footage and photographs. Malala’s father Ziauddin, himself a political activist despite his stammer, and a former teacher at a small school he ran himself, tells his own story of overcoming anxieties of public speaking with the assistance of some inspired animation designs that help convey the overall difficulty anyone in that situation would experience. These moments are genuinely warm and insightful, only because they actually seem to offer something more interesting and insightful than anything else that the filmmakers offer anywhere else throughout this movie. By no means is it a completely useless film, because it truly does offer a glimpse of someone that absolutely deserves attention for their causes and the genuine ordeals that they went through. But that’s just it: it’s only a glimpse of a much bigger picture, and Guggenheim just can’t seem to go further into detail about what really makes her an outstanding figure not just in the public eye but as a person herself. Her achievements are certainly detailed, to an extent – the receiving of her Nobel Peace Prize is quite literally tacked on to the end credits – but it’s like a student decided to write an essay about Malala Yousafzai and only wrote about what they read on her Wikipedia page, without investigating the references and sources listed at the bottom of the page. The intentions are clear, but the lack of true depth as shown with He Named Me Malala is something of a minor disservice to her overall efforts that deserve a more insightful film than this. He Named Me Malala is no doubt a well-intentioned film, attempting to document the life and activism of a heavily influential figure, but the lack of depth and true understanding about its core subject makes it a disappointingly standard documentary that really could have been something much more.